2013 Regal 35 Sport Coupe, twin Volvo V8 300hp engines with a joystick with only 119 hours. 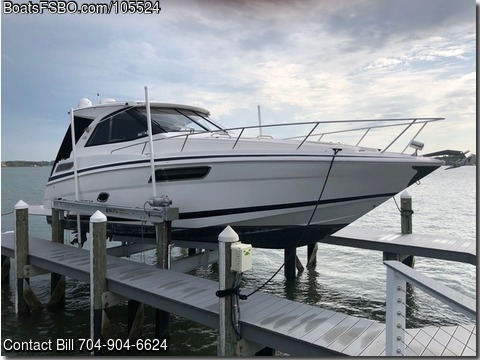 This boat features retractable hardtop, generator, satellite TV, foredeck sunpad with cover, extended swim platform, aft euro lounger with cover, cockpit grill, cockpit refrigerator, cockpit icemaker, cockpit AC, fold-down cockpit TV, GPS, Depth sounder, cabin has bed forward, full gallery with refrigerator, cooktop, sink and microwave, there is a vacuflush head, hot/cold shower, aft seating area that converts into a bed, flat screen TV aft, flat screen TV mail salon, Marine AC/heat, upgraded stereo with Fusion radio with internal iPod dock, transom remote. Sirius satellite radio, central vacuum system, windlass anchor, remote spotlight, ((RADAR)) and auto pilot. There is an extended warranty until December 2020. Might consider a trade for a 27 to 35 foot center console with 4 stroke motors.